No matter what time of year you read this, families will be picnicking on local cheeses and artisanal breads in Scripps Park, setting up the perfect panoramic shot of San Diego atop Mt. Soledad, and a scraggly, blonde-haired kid will tame a tasty wave at Windansea Beach. These are the many beaches and beach towns of San Diego, California and they are open for business 365 days out of the year. Join us in this strikingly beautiful, immensely livable city whose consistent year-round temperature highs between 65-70 degrees make it a favorite destination for visitors year ‘round. You’ll be treated to some of the most photogenic vistas you’ve ever seen. Experience the magic than on Old Town Trolley’s La Jolla and San Diego Beaches Tour. Board our colorful Beach Cruiser and be transported to the top of Mt. Soledad, 822 feet above sea level. There, you will be treated to a stunning 360-degree panoramic view of San Diego and the Pacific Ocean. You will disembark the Trolley for about 20 minutes for a spectacular photo opportunity! 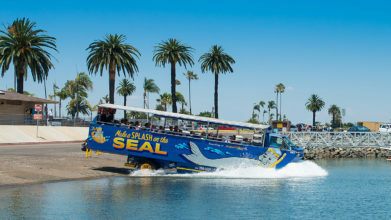 Then, you will re-board the Trolley and descend into La Jolla, “The Jewel” of San Diego, past the Cove and the famous Children’s Pool and into the heart of the Village where you will step off and spend the afternoon on your own experiencing Paradise by the sea! Your trolley will drop you off 0.6 miles from La Jolla Cove. Later, the Trolley will pick you up to continue your journey along the coast and through the beach towns of Pacific Beach and Mission Beach. You will pass the surfers at Windansea Beach, the Giant Dipper Roller Coaster at Belmont Park, and the SkyTower at Sea World as you return to Old Town and your starting point. Throughout the tour, you’ll see rocky cliffs and sandy beaches, reefs and tide pools, seals and surfers and lots of happy people enjoying the best that Southern California has to offer. Short on time for a day trip to La Jolla? Just tell your driver and stay on the trolley to continue your tour returning back to Old Town! Here is another opportunity to make you crazy with anticipation! Here’s a taste of what to expect when you climb on the Old Town Beach Cruiser for a day in the San Diego sun! Over 40 unique shops, the market celebrates the rich history of San Diego. From gourd art to Day of the Dead dolls to whimsical souvenirs. Also enjoy live events, authentic restaurants, and excellent open-air shopping. Wakeboarding, jet skiing, sailing, and camping are popular on the bay. With miles of light color sandy beaches and an equally long pedestrian path, the area is suitable for many outdoor activities. This main road takes you through the heart of the area’s residential community and, on a clear day, you’ll be granted an expansive view of the city that stretches all the way to downtown. This 822 ft. hill overlooking the Pacific Ocean is a prominent landmark in San Diego and a choice spot for panoramic views. You’ll also find the enormous Easter Cross here that demarcates a Korean War memorial. A twisty stretch of road that features many of the area’s beautiful homes that is popular with bicyclists. Dine in a world-class restaurant or have a picnic at Scripps Park, next to San Diego's most desirable spot for swimming, snorkeling, and diving. This area is a great place to observe local wildlife like dolphins and orcas in a captivating setting. This stretch of coastline road adjacent to La Jolla Cove borders a bevy of shops and restaurants as well as several hotels. A picturesque beach with sandstone points sticking out into the surf at both ends, this is a well-known surf spot. The beach is located at the base of a bluff and was named after a hotel that once stood here in the 1940s. This northern boundary of the California State Marine Reserve at the foot of a steep hill that leads to the beach. The recreation area is rife with unique rock formations and the mussels and barnacles that attach themselves to them. This road puts you right up against the majestic cliffs that lead out to the Pacific Ocean. Big Rock Reef, an exposed reef break that has quite consistent surf any time of the year is located here. This main artery, as its name would suggest, courses through the center of La Jolla where you’ll find plenty of galleries, services, restaurants, and everything you would expect from this beautiful seaside community. Located along Ocean Boulevard in Pacific Beach stretching some 70 blocks, this is a very popular hangout spot that features a pier, grassy areas, and free outdoor yoga classes. This historic oceanfront amusement park located in the Mission Beach area opened back in 1925 by sugar magnate John D. Spreckels. The park's most iconic attraction is the Giant Dipper roller coaster. Of the 70 miles of sandy coastline, the stand-out among the many inviting and appealing San Diego beach towns, La Jolla remains exceptional. La Jolla’s beauty only begins on its sandy shores facing the Pacific. Take a stroll inland through the center of town and you’ll be treated to some of the finest shopping, galleries, and dining anywhere in Southern California. This is one of our main stops where you’ll have the time to indulge in this truly magnificent destination! Tour departs from Old Town at 10:15am. See online reservations for specific tour dates and times or call our guest service department. When staying at a hotel, speak with your Concierge. *Reservations are required. Guests must check in 30 minutes prior to departure. Late check-in may result in forfeited reserved seat. First to check-in, first seated. Reservation based tickets are non-refundable. You may reschedule up to 24 hours in advance of tour time by calling 619-298-8687. These things still come in handy! We are pleased to provide shuttle service for guests staying at select hotels and downtown locations. Shuttle will take guests to Old Town to catch the 10:15am tour. The Shuttle returns downtown once each day leaving Old Town at 3:45pm. Reservations are required. Guests must check in 30 minutes prior to departure. Late check-in may result in forfeited reserved seat. First to check-in, first seated. Reservation based tickets are non-refundable. You may reschedule up to 24 hours in advance of tour time by calling 619-298-8687.